Your mission is to explore a treacherous island teeming with creatures of unknown origin. You will face ominous terrain, impenetrable jungles – and surprises beyond your imagination. A traditional off-road vehicle will not do. Your expedition will require something more… colossal. This summer, Universal Orlando Resort will bring the thrilling next generation of the King Kong legend to life in Skull Island: Reign of Kong. Everything about the new attraction will be massive. 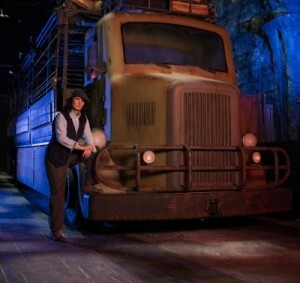 And Universal Orlando needed an entirely new – and revolutionary – way to transport guests into the middle of the adventure. The 40-foot-long, 17-ton expedition vehicle will use a sophisticated positioning system to independently navigate a rough, jungle road through unpredictable terrain. The front and back axles that support the vehicle’s 45-inch wheels can be steered individually, allowing the vehicle to take sharp turns and pull off complicated maneuvers. It will be one of the most immersive and realistic ride experiences on Earth – all within one of the most immersive and realistic theme park experiences ever created. Additional details about “Skull Island: Reign of Kong” are yet to be revealed. To stay up-to-date on all the latest news, visit www.universalorlando.com/ReignofKong.